Update: The Cross-Disciplinary Graduate Colloquium Evening has been rescheduled for Friday, April 6 at 4:00 PM in Bousfield A106. Due to the impending weather, we have decided to postpone the inaugural Cross-Disciplinary Graduate Colloquium Evening, originally scheduled to take place tomorrow. Details regarding the rescheduled event will be forthcoming. The social division is pleased to host Dr. Philip Corlett, who will give a talk entitled, “Finding Beliefs in the Brain: Hallucinations, Delusions & Predictive Processing” on Wednesday, Sept 6, 2017, from 1:25 – 2:55pm, in BOUS 162. The Graduate School just announced their travel awards for this year. The funds usually get depleted within a couple of weeks, so if you have completed 30+ graduate credits and plan to present at a conference before December 31st, you should apply ASAP. Please visit http://soapbox.uconn.edu/public/storyView.php?id=38163&cid=40&iid=6351 for more information. Full details (and forms for the required letter of intent) can be found on the Institute website. The seed fund is intended to fund activities in the Brain and Cognitive Sciences (broadly construed) that are likely to lead to applications for external funding, or which otherwise contribute to the mission of the Institute. Preference will be given to activities that involve collaboration and expertise across laboratories and/or traditional disciplinary boundaries. Applications for small grants (<$10,000) can be submitted at any time; applications in excess of $10,000 should be submitted by May 1st, 2017. The Departments of Psychological Sciences, English, Journalism, and the Human Rights Institute co-sponsor a public talk by UK-based journalist Ismail Einashe on Tuesday, March 21, at 4 pm in BOUS Room 160. Mr. Einashe writes about migration, trauma, war, citizenship, Brexit and Trump’s immigration policy proposals for Warscapes, The Guardian, The Nation and other trustworthy media outlets. His talk is open to the public and is followed by a Q&A and pizza reception with students. Please come! 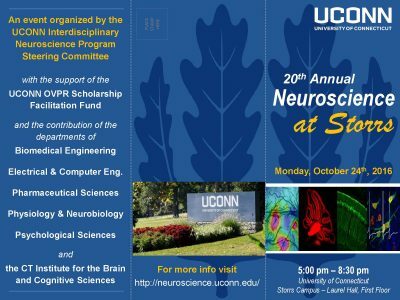 Monday, October 24th, 2016 from 5pm to 8:30pm in Laurel Hall, first floor, Storrs Campus. Please share this invitation with your students, postdocs, and fellow researchers. An itinerary of the symposium is reported below and in the attached brochure. Dr. Bin Feng (fengb@uconn.edu) – Dr. Sabato Santaniello (sabato.santaniello@uconn.edu) in the Biomedical Engineering department. (6pm – 8:30pm) Reception, poster session and data blitz: A reception will follow the keynote lecture along with a poster session and short podium presentations (a.k.a. “data blitz”). Trainees with an interest in neuroscience are warmly encouraged to contribute to the poster and podium presentations. A prize will be assigned to the best short presentation. Further details will be emailed separately.